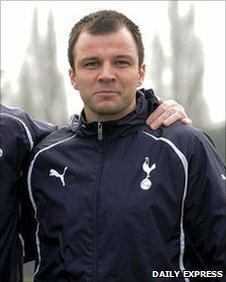 Newport County have named Tottenham Hotspur reserve team coach Anthony Hudson as their new manager. The 30-year-old, son of former England and Chelsea midfielder Alan, succeeds Dean Holdsworth who left for League Two side Aldershot in January. Hudson has come highly recommended to County from Spurs boss Harry Redknapp. He will take charge after Saturday's Blue Square Bet Premier match at home to Grimsby Town after signing an initial one-year deal. Tim Harris has been caretaker manager of the Blue Square Bet Premier side since Holdsworth left his position. County chiefs interviewed more than 10 potential candidates before creating a shortlist earlier this week. Ex-Republic of Ireland defender Liam Daish, now manager of Ebbsfleet United, and one-time Hartlepool United assistant Colin West were among the favourites. Harris had insisted the Spytty Park club were in no rush to find a full-time replacement for former Premier League striker Holdsworth, who had guided County to the Blue Square Bet South title last season and into the Premier play-off zone this term. County were initially not due to name a new manager until the end of the season but the Welsh club have won just two of their 13 games since Holdsworth's departure. So County have ended their two-and-a-half months without a permanent manager by offering the role to Hudson. Hudson, a respected member of Redknapp's Tottenham backroom staff, was interviewed last week and wants his first managerial role in English football. Redknapp called County director Matt Southall to give Hudson a personal reference. Seattle-born Hudson played midfield for West Ham's youth team - where he was a room-mate of current England and Manchester United star Michael Carrick - before joining Dutch side Nijmegen after his release by the Hammers. But after quitting playing, he started his coaching badges and passed his Uefa A licence on a course with Roy Keane and Gareth Southgate. Hudson was named coach of Real Maryland in the United States Second Division, a competition below Major League Soccer, and guided them to the play-offs and was nominated as coach of the year. Spurs boss Redknapp offered Hudson work with the Premier League club's reserve team and has also taken first-team training sessions under John Still at League One Dagenham and Redbridge. "I have been touched by the help Harry and John have given me," Hudson told the Daily Express on Wednesday. "Now I want to take a team of my own to show the feeling and the intuition I have for players and the job." Former Premier League stars Paulo Di Canio and John Hartson initially showed an interest in the vacant County job before withdrawing their applications. Former Port Vale manager Martin Foyle, David Holdsworth, twin brother of former boss Dean, and one-time West Ham United defenders Rigobert Song and Julian Dicks are all understood to have been interviewed by Newport.